To support the fight back against police secrecy, come to the demo on April 5th. The Metropolitan Police Service (MPS) state they have a ‘policy’ of ‘Neither Confirm Nor Deny’ (NCND) in relation to undercover officers. This means that when asked whether one of their officers is an undercover, they reply to the effect of “We can neither confirm nor deny that XXXX was an undercover officer”. NCND is first and foremost a stance adopted by the security and intelligence services whose officials are deployed in intelligence gathering operations. It doesn’t have any legal standing. The police’s use of it is much more recent, and no evidence has been presented of it as a written MPS policy, despite being ordered to present it by a court. Pitchford has refused to allow a blanket application of NCND in the Inquiry, and instead has insisted on looking individually at each situation where the police are asking for secrecy. He has asked them to apply for restriction orders in each situation, and will test any proclaimed risk of harm against the public interest of revealing what the undercover police have been up to. It is through this process that the police are now seeking secrecy and delays to the Inquiry. The Inquiry into Undercover Policing has come about through the hard work of the people affected, activists, and a whistle blower. The police have fought at every turn in court, to avoid having to give any information publicly about their secret political policing units. They use NCND, and their applications for restriction orders, as a shield to avoid proper scrutiny of their actions, and to cover up the illegal and immoral activities of political undercover police officers. Want to stand with the people affected by undercover policing and demand the truth about the activities of these abusive political policing units? Come to the demo, outside the Royal Courts of Justice, 9-10am on the 5th of April. 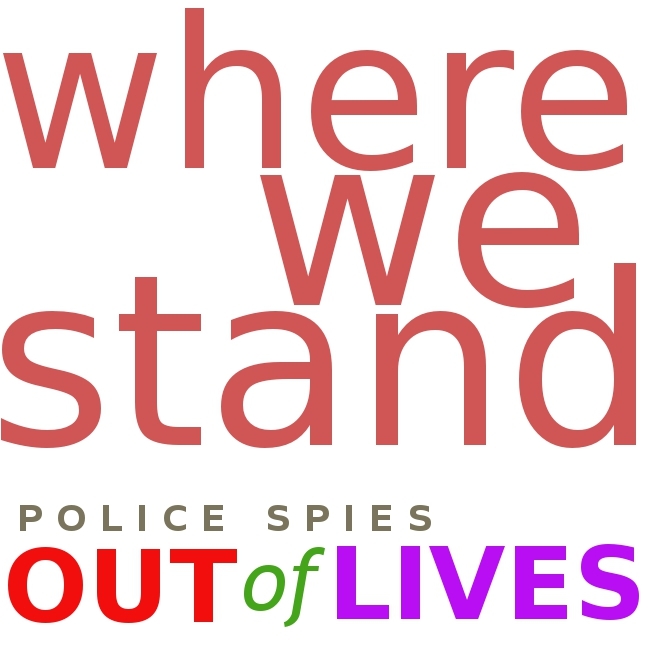 Find out more you can do to support the fight for truth around undercover policing. The Undercover Policing Inquiry (1) has named John Dines as an undercover police officer (2), the third officer confirmed in recent weeks (3). John Dines was the long term partner of Helen Steel (4), who until recently was suing (5) the police, with seven other women who had been deceived into relationships with undercover officers. It was Helen’s search for John Barker, after he had disappeared from her life, which revealed he was John Dines, an undercover officer. This is only being confirmed by the Inquiry now. Despite settling her legal action with a comprehensive apology (6), the police have until now refused to admit that John Dines was an undercover officer, relying on their ‘policy’ of ‘neither confirm nor deny’ (7). “While I welcome the official admission that my former partner John Dines was an undercover policeman in the Special Demonstration Squad, it is a travesty that the police have been allowed to take this long to confirm what I and others exposed years ago. Even after they issued a public apology for serious human rights abuses to myself and six other women who had been deceived into relationships with undercover policemen, the police still argued they could not confirm the identity of my abuser. To date, despite that apology, they have also refused to confirm the identity of Mark Jenner who deceived ‘Alison’ into a five year relationship. We and other women similarly deceived have had no disclosure at all about how these abusive relationships were allowed to happen, instead we have been subjected to intrusive demands for evidence of the effects of the abuse. None of those responsible for this abuse have been held to account – even those still employed by the police have kept their jobs. 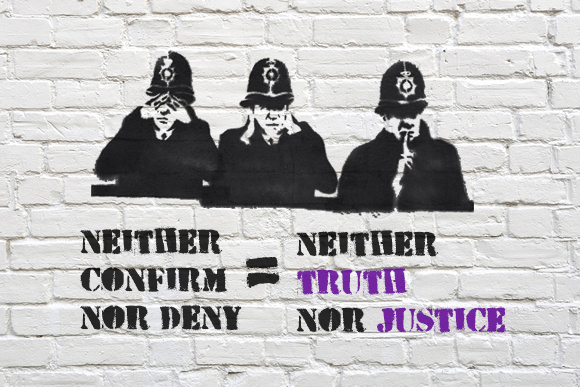 It is an insult to the many victims of political undercover policing that the police who are responsible for serious human rights abuses have been allowed to cover up the truth and withhold information from those they abused. The public inquiry should release as a matter of urgency the cover names of all these political police and also the files they compiled on campaigners, so that those spied on are able to understand what happened and give relevant evidence to the inquiry. 2) The Undercover Policing Inquiry confirmed him as an officer today on 20th December 2016. 3) Carlo Neri and Marco Jacobs were also recently confirmed as undercover officers (see Guardian report). They had also previously been identified by activists as an undercover police officer, and are also the subject of legal actions against the police. 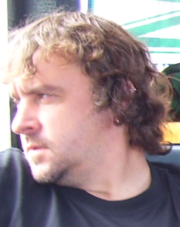 The police have as yet failed to admit that Mark Jenner was an undercover officer. He had a relationship with ‘ Alison’, one of the seven other women who took the legal action against the police with Helen Steel. 6) As part of an out-of-court settlement for seven out of the eight claims, the Met police issued a comprehensive apology in November 2015 – their first admission that the relationships had taken place and had caused significant damage. 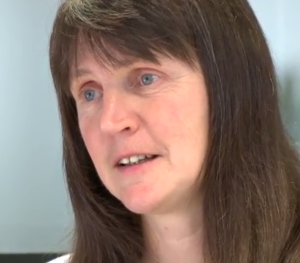 Other civil cases being brought against the police over undercover policing continue. 7) The police say that they have a ‘policy’ of ‘Neither Confirm Nor Deny’ (NCND) in relation to undercover officers. If anyone asks whether one of their officers is an undercover, they reply with words to the effect of “We can neither confirm nor deny that X person was an undercover officer”. NCND doesn’t have any legal standing, or even appear to be a proper policy. Despite this, and despite the very serious nature of the many allegations against undercover units, the police are seeking to in the Inquiry see Secrets beyond lies briefing. Helen Steel herself demolished NCND at the hearing about restriction orders and secrecy in the Inquiry into Undercover Policing – for a transcript see here.